An adaptation of his own short film, Shane Acker’s 9 is a beautiful feature animation with much more style than substance. That being said, the style is truly awe-inspiring. In a post-apocalyptic wasteland, a hand made mechanical doll awakens to find his creator dead and himself hunted by terrifying mechanised monstrosities. He bands together with other like creations (numbered 1-9, so as to avoid confusion with Slipknot) to fight their predators and discover the meaning of their existence. The opening moments of 9 are spellbinding. There is an incredible sadness one feels at seeing the character 9 (Elijah Wood) being thrust rudely into consciousness and being greeted by nothing but death and decay. 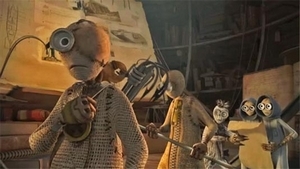 The character animations are the film’s strong point and 9, together with his other friends, invoke great sympathy as Frankenstein’s monster-type ragdoll creations. As with all good animation, their simple design (no ultra-realism here, á la Beowulf) means that their expressions are wonderfully basic yet exaggerated. The world they inhabit is a thing of rusting beauty, perhaps reminiscent of the PC game ‘Fallout 3’. In fact, the animation immediately brings to mind computer games – the ‘handmade’ characters look a little like those from ‘LittleBigPlanet’ and whilst watching, it did occur to me that this would have made a particularly heartfelt gaming experience. The other elements are things we’ve seen before (for instance one of the monsters looks like it’s straight out of The Matrix, and the opening titles are remarkably similar to those of Coraline). The voice acting is decent. Elijah Wood, John C. Reilly and Christopher Plummer are all instantly recognisable, whereas I didn’t even realise I was listening to Jennifer Connelly’s vocal talents. The score is also fantastic. It’s by Deborah Lurie but features ‘themes’ by Danny Elfman, which thankfully don’t stand out as Elfman’s work usually does. Despite the beautiful presentation and the lovable characters, the unravelling of the central mystery of their existence is pretty disappointing. In fact, in retrospect, large portions of the premise don’t make sense. Whilst I was enthralled by their tale (and wowed by the action sequences), the experience was ultimately disappointing, particularly if one was hoping for a plot to match the intricate and gorgeous visuals. If the story telling matched the production values, then this would be a fantastic feature indeed. This entry was posted in Film Reviews and tagged Animation, Science Fiction, Steampunk by Stuart Wilson. Bookmark the permalink.